Last month, I started helping out at a local HIV-AIDS clinic. LIGHT doctors partner with a local Catholic church to provide a weekly “medical home” clinic for people living with HIV/AIDS (PLWHA). People who come here already know they are infected and get their medicines, labs, and most of their care done at the various clinics and hospitals. We help provide coordination of care, help diagnose opportunistic infections, do some teaching about the disease, as well as provide social support. Some money through the Catholic program is available for medicines or surgery. Home visits are often made. People know about the clinic either by word of mouth or by brochures placed at the CDC (where they get tested) or hospital clinics. 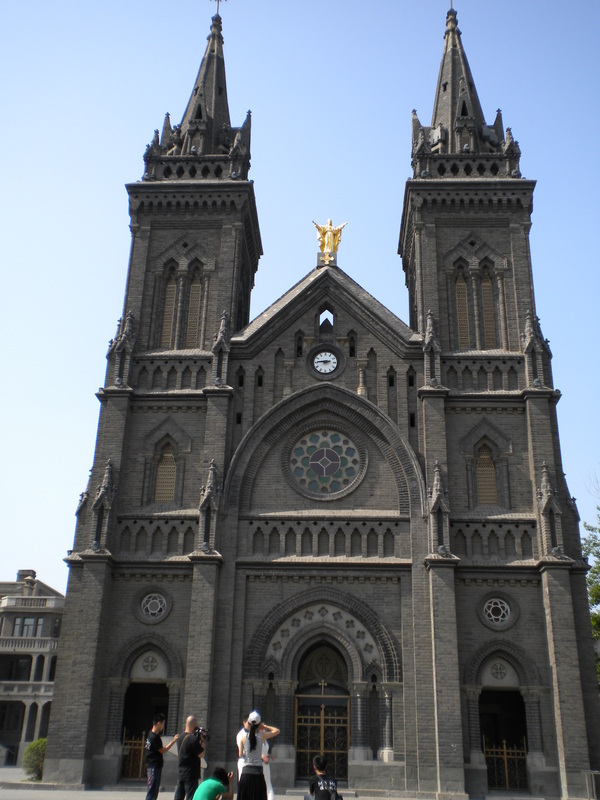 As you can see, the Nanguan Catholic Church is a stunning historic building (built in 1878) and is considered one of the most beautiful churches in China. Some patients come every week whether or not they need to just because the clinic provides their only support. I met a man whose wife knows he is positive, but is afraid to get tested. No one else knows he is positive. Others share about the support within their homosexual groups. Others have been raped and share a double disgrace. As of yet, we have yet to make contact with any prostituted women, but that of course is one of the goals. Above and beyond the medical care we hope to provide is the holistic care of meeting people where they are. We hope to provide a safe place for them, a place without stigma or discrimination. The system of care here for PLWHA is confusing and complicated and expensive. They can go only to certain hospitals for certain problems and many in this city end up going to Beijing for care because the physicians there are more familiar with opportunistic infections and other aspects of AIDS. They also feel that their confidentiality is safer there as well. I say that HIV/AIDS is more of the same because the level of secrecy, political embarrassment, misinformation, and discrimination that exists in a China that aspires to be modern and a world leader is appalling and there has not been a significant change in the thinking of the general population or in the policies of the government or health care. Prominent AIDS activists are still being forced to flee for speaking out about the problem – the latest one is Wan Yanhai and his story is found in this Guardian article. A recent UNAIDS publication on stigma and HIV in China revealed some sad statistics. I’m well aware, even in my own small circles, of the level of ignorance in this country about this disease in the general population, but the health care professionals have a long way to go in combating discrimination. More than 15% of the respondents reported that a health care professional broke confidentiality and shared their positive status without consent. About 12% said that they had been refused health care at least once for being HIV positive, and 12% of women who got pregnant after being infected said they had been pressured to have an abortion by medical or family planning staff . Categories: medical | Tags: HIV/AIDS | Permalink.